Tampa was the 6th best market for real estate Investors in 2015, and the 9th best market for residential property appreciation. Tampa is consistently recognized as one of the best real estate investment markets in the U.S. So, here are some tips for investing in Tampa real estate. 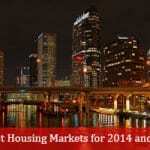 2014’s hottest housing markets are still sizzling hot, as some new markets catch fire for 2015.